Tennis Monte Carlo Rolex Masters 14-22 April 2018. The Monte Carlo Rolex Masters is part of the ATP Masters Series of the Association of Tennis Professionals (ATP) Tour and is played on clay courts every year in April. 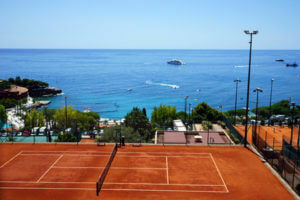 It’s considered as one of the favourite tournaments on the calendar, not only thanks to the spectacular views of the Mediterranean Sea but also for the long tradition of champions that have played the courts. The top tennis man players of the world participate in this tournament. Come to the French Riviera to see all the action at the Masters Series– Tennis Monte Carlo Masters in what many consider the most picturesque tournament setting in the world and stay at Villa Anabel for an unforgettable week! Buy ticket here for Rolex Masters or contact our concierge service! During tennis tournament days you can spend great time in our luxurious villa with full privacy. Villa Anabel is a harmonious blend of glamour, tranquility and seclusion and is located only a few minutes‘ drive from the court of Monte Carlo Country Club, the place of Rolex Masters. 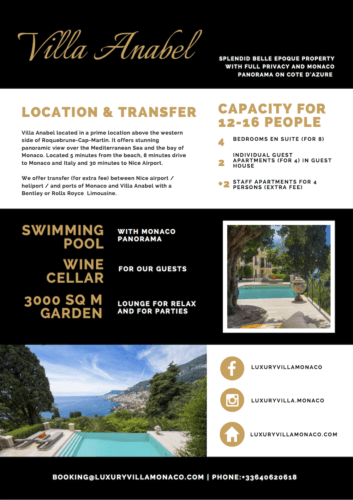 If you want to participate in the pulse of Monaco after a rest in a private hotel, Villa Anabel is the perfect choice . Our wine cellar and swimming pool with Monaco panorama in addition to exceptional outdoor areas are ideal for intimate lounging.